Materials: Loose parts (such as buttons, yarn, string, sticks, beads, foam, etc.) empty frame, mirror, oval shaped piece of construction paper or felt. What to Do: Set a mirror in front of your child. Ask her “What different things on your face make you special?” Allow her time to imagine and explore her face with a mirror. Have her make different faces in the mirror and see how her face changes. After a few minutes of observing, now encourage her to make her face out of the random assortment of parts you have collected! Place the oval shaped piece of foam/paper in the empty frame. This oval will act as the face. Once the face is built, take a picture of it to print out and frame! Language and Communication: Once your child’s face is complete, ask him what he used to build it. This will help him understand the engineering design process! Ask how many eyes, noses, mouths, etc. are on the face. Point out that the different craft items used to make the facial features all have other uses, but they work together to create something new. 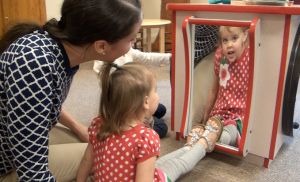 Expand the Activity: To expand this activity, have your child improve the face she built by seeing if she can make it have other expressions, such as sad or laughing. Have her create your face or a sibling’s face! If she has a favorite book or show, have her create the character. 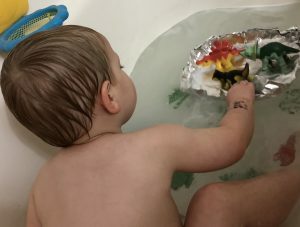 Materials: The bath tub, water, aluminum foil, scissors, variety of small plastic toys such as cars, animals, or other small objects. Language and Communication: Ask your child if their boat floats. Ask them to count the number of toys they have placed on the boat. If they have two toys floating on their boat, ask them to add two more toys. If this is successful ask them how many toys are there now. This encourages the concept of addition without needing to know how to add. Expand the Activity: Change the shape of your boat. Have your child build their own boat. Add bubbles for another challenge. Materials: 12-inch cardboard circle, 4-inch Styrofoam ball, serrated knife, glue gun, items for balancing. What to do: Cut the ball in half, hot glue the cut side to the center of the bottom of your cardboard circle. Place the half-ball glued to the circle on the floor so that it is balancing on its ball’s round surface. Have your toddler begin adding items to the circle. Language and Communication: As your toddler is putting items on the circle ask them how many items they have. Ask them to put the same amount on the opposite side to see what happens. Tell them in order to balance something that the number of things or the weight needs to be the same on both sides of the circle. Expand the Activity: Cut a small part off the bottom of the ball and see how many toys your toddler can add to the circle until it tips over. Materials: Variety of flexible plastic containers, (buckets, ice cube trays or ice molds) water, freezable toys, turkey basters, large tub or bath tub, timer extension requires tools. What to do: Take a container and pour water into the container. Place a couple of toys into the container. Space the toys out and allow that to freeze slightly. After about a half hour to an hour add more toys and water to the bucket. Leave over night for thorough freezing. The next day, or once the water is completely frozen, dump the ice out of the containers into the large tub or bath tub. Add some water to the tub and have your child use the turkey baster to squeeze up water and squirt it onto the ice blocks. Have them keep doing this until the ice is melted and their toys are free. You may add a timer to this activity to see how long it takes to get a toy free from the ice. This will introduce time to your child and how long something can take. 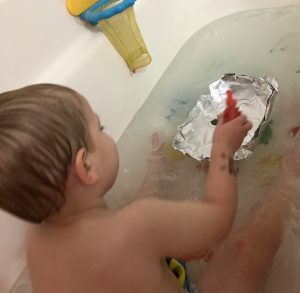 If your child loses interest leave the ice blocks sitting in your tub and have them come back later for an easier exploration. Language and Communication: Discuss with your child how fossils work and how tools help archaeologists uncover fossils. Ask your child what toy they are trying for and how they plan to get it out. Expand the Activity: Extend this activity but adding tools they could strike the ice with.